After a very long period of near irrelevance in the desktop, high-end desktop (HEDT) and server processor market segments, AMD has released three new processor families based on their Zen architecture that are actually quite competitive with current Intel processor in these three market segments. These are the AMD Ryzen, AMD Ryzen Threadripper, and AMD EPYC 7000 families. We’ll skip the AMD Ryzen desktop processors for now and jump right into the AMD Ryzen Threadripper processors. On August 10, 2017, AMD finally released their new super high-end desktop (SHED) processor family, the AMD Ryzen Threadripper. There are two initial SKUs in the lineup, the 1950X and the 1920X. 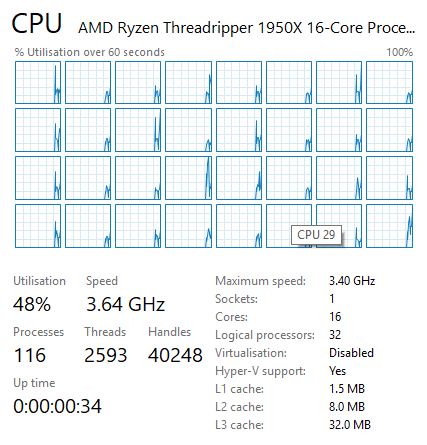 The $999.00 Threadripper 1950X has a base clock speed of 3.4GHz, with 16 physical cores plus SMT (which is AMD’s version of hyper-threading), so you get 32 logical cores total. The $799.00 Threadripper 1920X has a base clock speed of 3.5GHz with 12 physical cores plus SMT, for a total of 24 logical cores. Other SKUs with lower core counts will be added over the next few months. These first two models are actually available for sale, so this is not a “soft launch”. Multiple motherboards are also available to support this new processor family. Both models will have 32MB of L3 cache, and will have 64 PCIe 3.0 lanes available on the processor, with 60 of those lanes available for things like multiple discrete graphics cards, multiple M.2 PCIe 3.0 x4 NVMe storage devices and 10GbE networking. Both models will also have a boost clock speed of 4.0 GHz and an XFR boost clock speed of 4.2GHz. These new X399-based motherboards have eight DDR4 memory slots that support ECC RAM, so you can have 128GB of RAM with commodity 16GB DDR4 DIMMs. The processor itself will support up to 1TB of RAM when 128GB LR-DIMMs (Load Reduced DIMMs) are used, as these larger DIMMs become available and affordable. Another interesting fact about these processors is that they actually have two NUMA nodes at the hardware level. Hardware NUMA mode can be disabled in the BIOS (since some desktop/consumer software is not NUMA-aware). Figure 1 shows what Windows Server 2016 Task Manager looks like when it is configured to display NUMA nodes and hardware NUMA is enabled (and SMT is also disabled). Figure 2 shows what 32 logical processors look like in Windows Server 2016 Task Manager. SQL Server 2016 has a new feature called automatic soft NUMA which is enabled by default when you have more than eight logical processors in a NUMA node. You can disable automatic soft NUMA with an sp_configure setting. 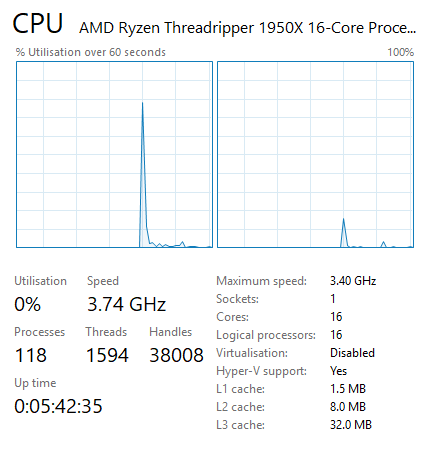 Both of these initial Threadripper models have enough logical cores to let you experiment with hardware NUMA and with automatic soft NUMA in SQL Server 2016. This processor family is relevant for a Data Professional who might want to have a relatively affordable (especially compared to a competing Intel HEDT processor, which costs about twice as much) workstation to run large SQL Server workloads or multiple concurrent decent sized VMs on a desktop development and testing machine without being as quickly constrained by I/O, memory or processor core count limitations. The bottom line here is that you can buy/build a very powerful desktop machine for virtualization or heavy duty SQL Server development and testing usage for a lot less money than if you use an Intel Skylake-X HEDT platform. On June 20, AMD formally rolled out the EPYC series of processors for one and two-socket servers. These are based on the same Zen architecture used on the AMD Ryzen desktop and AMD Ryzen Threadripper processors. The series begins with two-socket processor models designed to offer more physical cores, memory bandwidth, and PCIe 3.0 lanes compared to the current Intel Scalable Processor family or the previous generation Intel Xeon E5-2600 v4 family processors. There are nine different models for two-socket servers, ranging from the eight-core EPYC 7251 to the 32-core EPYC 7601. All of these models have SMT, and Max Boost (AMD’s version of Turbo Boost). They also offer eight-channels of DDR4-2666 support (that have a total capacity of 2TB of RAM per socket) and 128 PCIe 3.0 lanes per socket. There are also three models specifically for one-socket servers (that have a P model number suffix), ranging from the 16-core EPYC 7351P to the 32-core EPYC 7551P. You can use a non-P SKU in a one-socket server. All of these models have all of the same specifications and support for SMT, Max Boost, memory capacity and PCIe 3.0 lane counts. Unlike Intel, AMD does not artificially cripple some SKUs for product differentiation purposes. Each physical processor has four Core Complexes (CCX) tied together with something AMD calls Infinity Fabric. Infinity Fabric consists of a Scalable Data Fabric (SDF) and a Scalable Control Fabric (SCF), and it is used for both intra-processor and socket-to-socket communication. Each physical processor shows up as four NUMA nodes in Windows Server 2016. These new processor families are game-changers for AMD. They finally have new processors that can compete with current Intel processors (depending on the particular benchmark) for significantly less money. Within the hardware enthusiast community, there is an incredible amount of pent-up hostility towards Intel for their monopolistic behavior and slow pace of processor product innovation over the past ten years. It will be interesting to see whether this sentiment is shared in the server community, and whether AMD will be able to capture some of the server market share. It's good to see competition in the consumer CPU space again. I started looking into replacing my old i7-2600 system recently and was surprised to see the Ryzen family was not only competitive, but actually a better value, especially the 1700 when overclocked. I held off because the 1700-1850 are currently restricted to 64GB memory. The new Threadrippers support 128GB, and look to be better multi-threaded than Intel's i9's (at least for video editing, which is why I'm interested in upgrading). I'm curious to see if single-threaded performance on the EPYCs will be close enough to Intel's that they can find their way into mainstream servers like Dell & HP. Regardless, it's exciting that buying an Intel CPU isn't a foregone conclusion anymore.